Life is uncertain, eat the dessert first. Or, in other words, don’t postpone the good stuff for the time you might not be able to do it. Use your best years to collect memories, to make friends all over the world, to learn to fly, to climb peaks, to dive into oceans and to eat a loooot of ice-cream. 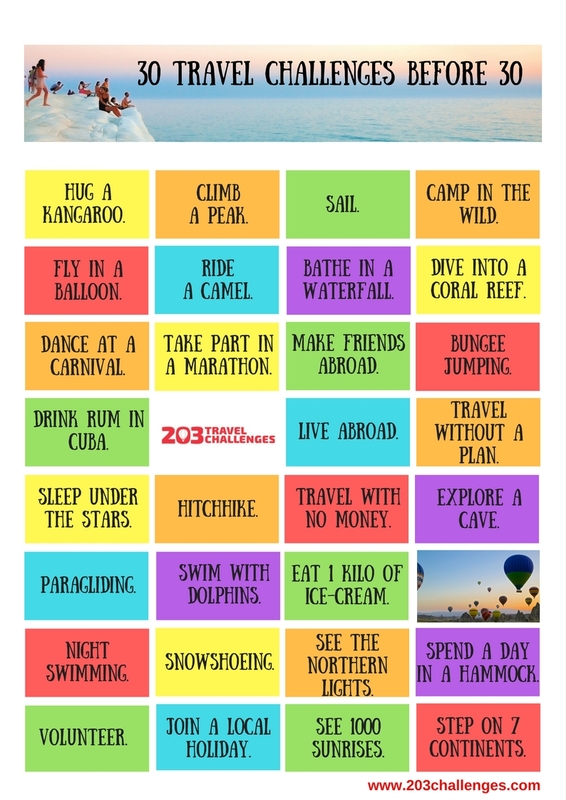 Here’s a list of 30 amazing travel challenges to complete before you turn 30. There’s a lot of time to go and the best way to keep track of how the challenge is coming on is to print the list and hang it on the wall. You can download a printable pdf (A4/8.5 by 11.0 inches) here. Dive into a coral reef. Take part in a marathon. Eat 1 kilo of ice-cream. Spend a day in a hammock. Would you like more challenges? How about a book containing “203 Travel Challenges”? Available as ebook (Kindle edition) and paperback.